Tim Burton is not only a well-known contemporary film director, he is also very artistic with a twisted sense of humour. A recent exhibition (2011) of his work from New York's MoMA (Museum of Modern Art) featured not only props and notes related to his movies, but also drawings of strange characters dating back to Tim Burton's childhood. For this sculpture assignment, you will create your own strange Tim Burton inspired character - an "unlikely hero." 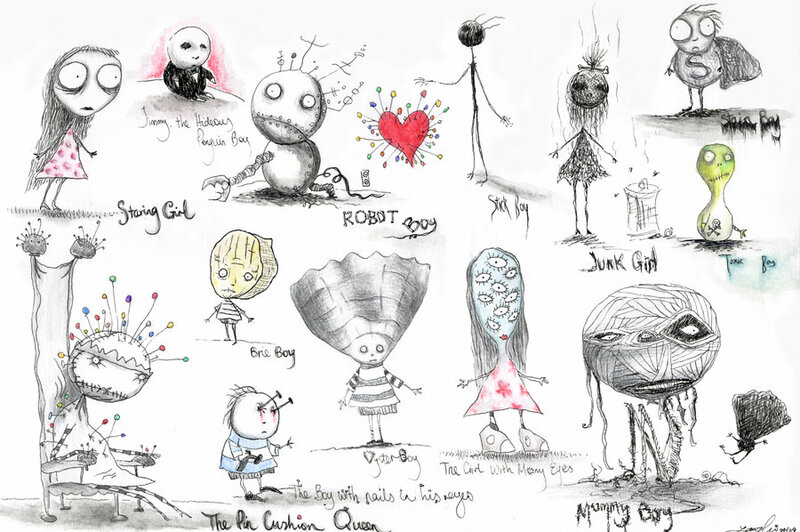 Take a look at some of Tim Burton's characters in class and on the Internet. Pay attention to reoccurring features in them. 2. Include some odd, asymmetrical, or exaggerated features. 3. Give your character a strange / unusual superhero power (e.g. Tim Burton's "Stain Boy"); don't be afraid to give him / her some weird additions (e.g. "Edward Scissorhands"). (10 marks) How original / creative your finished character? (20 marks) How well did you build your sculpture to create form (3-dimensionality) and asymmetrical balance? (10 marks) How polished is your completed sculpture - have details such as textures / colour have been neatly included? Write a story related to your character. It could be "a day in the life of..." or how your creature was created - be creative and original (it's up to you). Please note that spelling and grammar will be assessed as well as creativity. This can be handwritten or typed - approximately 1 page in length.